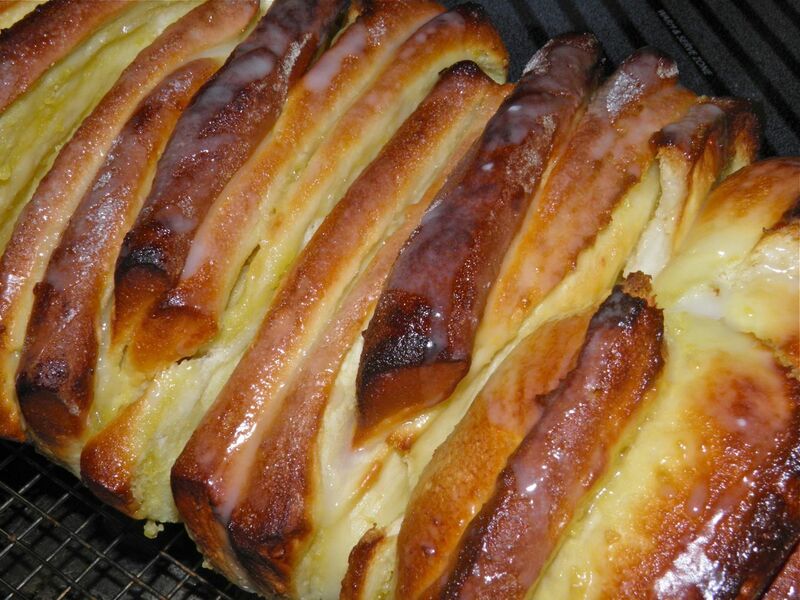 "Slices" of sweet dough with tart lemon curd between. This tastes as good as it looks.... and is great for breakfast. I've fallen in love with my dough hook. Ohhhh, to have Jane Addams’ problem… This is the recipe I promised yesterday. Actually, yesterday’s post on Best Lemon Curd was just the warm-up to this – the main event. I have been looking at pull-apart (also known as monkey) bread for a while now. Where the names comes from is unknown. Some say that it is derived from the monkey puzzle tree, but I doubt that very much. We have a monkey puzzle tree growing in our yard. You be the judge. See the link above. These types of bread, also called sticky bread, monkey brains, african coffee cake and bubble loaf are usually composed of balls of yeast dough that are coated in various things, like cinnamon sugar, butter and pecans. They are then packed into a pan and baked. To serve, you just pull off what you want with your hands. bread-making. This is the first raise, after 1 hr 45 min. Pull-aparts are a uniquely American bread and are almost unknown outside the United States. They first recipes appeared in women’s magazines of the 1950s. 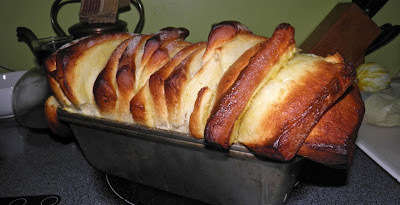 There is an African fruit called monkey bread from the monkey bread tree ( Adansonia digitata) but this dessert bread has nothing at all to do with it. Regardless, pull-apart is a fun way to introduce a dessert to the table, be it breakfast, lunch or dinner. The technique is not too difficult. I read a few recipes for this type of “slice” presentation and the directions were very difficult to follow. Mind numbingly in one case. I have simplified them greatly and I believe you will find them easy to follow. It’s a little on the messy side to make once you get out the lemon curd, but only a little and well worth the very slight cleanup you’ll have to do on your cutting board. This dough recipe is identical to that I used for my pizza swirls (see link at top) except that the sugar content is higher. It produces a light, fluffy, sweet dough that’s perfect for dessert-type breads. The dough has many other uses as well. Use your imagination. 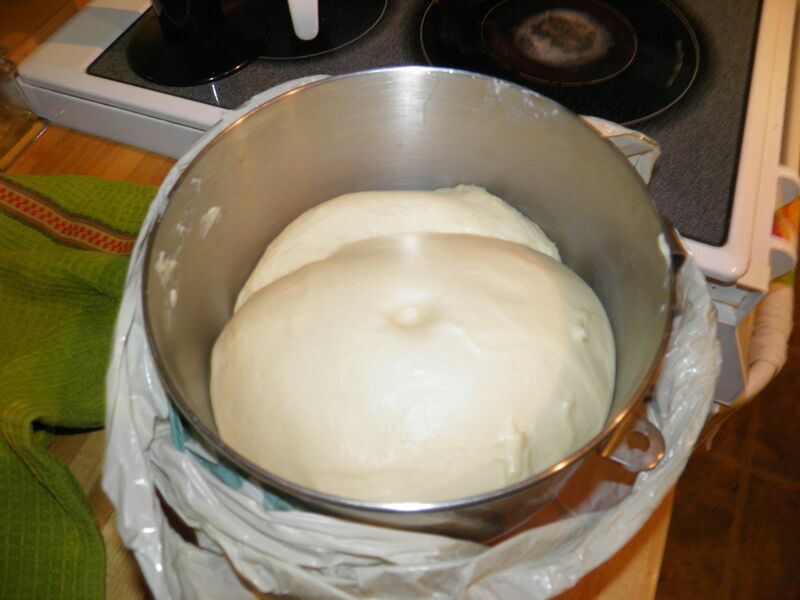 Roll the dough out to about 20" x 12". I made 1 L of lemon curd with the recipe posted yesterday (link at top).This recipe takes 1.5 cups. I have eaten some but will have to figure out a couple other clever ways to use it up. Thank goodness it's delicious. Anyone have any ideas? I’m open to suggestions. If you wish you could easily substitute cinnamon sugar for the curd. I would suggest 1 cup sugar, mixed with 1 tbsp ground cinnamon. 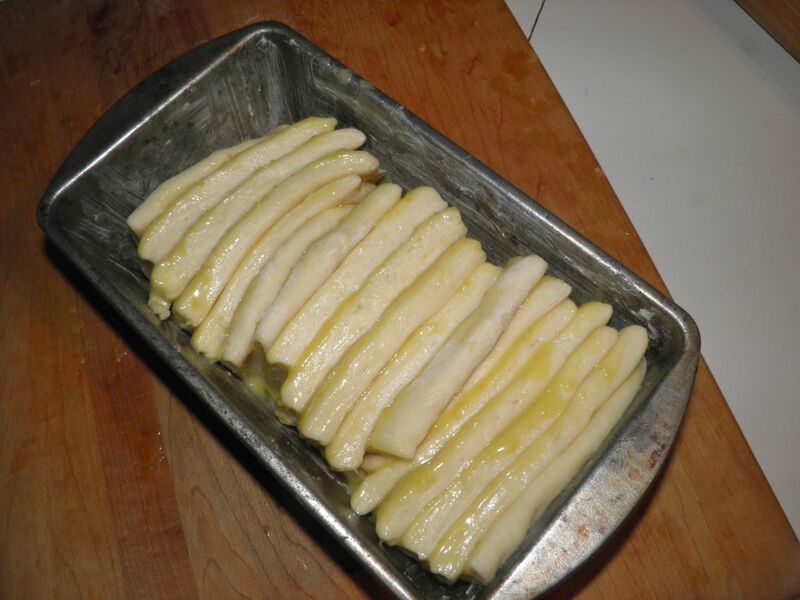 Brush melted butter on the strips (see recipe), then dust with the sugar and proceed. I hope some of you try this recipe. This damp, humid weather has been great for making bread. Stacked in the buttered pan and all ready to rise again. Place the sugar, yeast and warm water a bowl. 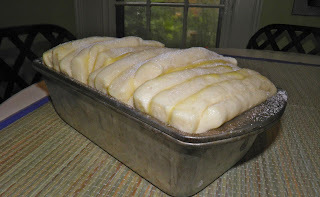 Let stand, covered, until creamy, about 10-15 minutes. I now do mine in my KitchenAid bowl so the machine can knead the dough. I love making bread but kneading isn’t my most favourite job. Add the milk, vegetable oil, salt, eggs and one cup of the flour. Mix until completely incorporated. Then, cup by cup, add the rest of the flour. Knead with the dough hook until smooth, about 8 minutes, or by hand for 12 minutes. Since the moisture content in flour varies by the atmospheric conditions you may need to add a little more or less flour. You’re looking for a smooth bust still a tiny bit sticky dough. This is after another 30 minutes. All ready for the oven. I sprinkled the top with sugar before baking. It's optional. Cover the bowl with plastic wrap and a towel and let rise until at least doubled in volume, about 1-1/2 hours. Punch the dough down and place it on a lightly floured rolling surface. 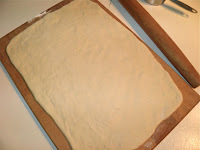 Roll the dough out to a rectangle approximately 12” x 20”. 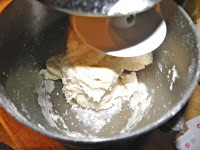 The dough will try to spring back but be persistent and keep square corners as much as you can. It helps you get the most out of your next step. Next spread the curd evenly over the rolled dough. Take care to get it out to the edges as much as possible. Then cut the dough in three strips lengthwise. This makes three strips about 4” x 20”. Then cut each of those strips into six equal (sort of…) rectangles. This gives you 18 pieces of dough about 4" x 3.5". It may get a bit sticky cutting through the curd, but that’s OK. You'll live. Preheat the oven to 350°F. Generously butter a 6x10 loaf pan. This is slightly larger than a normal loaf pan but you’ll need the room. Start stacking the rectangles in the loaf pan starting with the first piece with the curd facing in. Finish with the last piece facing in as well. This puts dough with no curd facing out on both ends. Cover and let rise in a warm place until above the pan about 1”, approximately 30-40 minutes. Bake in the oven for 40-50 minutes, or until golden brown on top. These types of breads have a penchant for being doughy in the centre so don’t worry if the really starts to brown on top. Fun looking, eh? Also delicious. While the loaf is still warm mix together the lemon juice and icing sugar. Pour over the top of the loaf. Let the loaf cool almost completely in the pan, then remove and enjoy. Looks excellent! I've still yet to make any kind of bread. Ever. I don't know what's wrong with me! As for the remaining lemon curd, what about lemon macarons? The curd is a great filling. I'm a macaron fiend. Hmm... macarons. Maybe. I've been tasting it away. 1 L isn't a whole lot it appears... I'll have to check into it. Thanks!